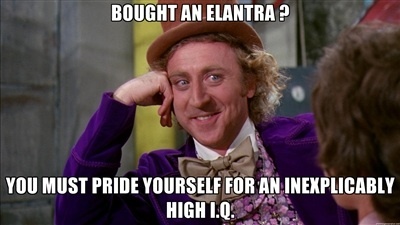 ElantraClub - For Elantra Owners and Enthusiasts > Newbie from Greer, SC x2! Full Version: Newbie from Greer, SC x2! I just bought my first Hyundai after renting one to go to the Detroit Auto show in January. Well let me back up; we bought my husband a 2013 Santa Fe with the goodies. Before the night was up, we bought me a 2013 Elantra Coupe 6-spd. I'll post pics as soon as I pull up a chair here and grab my cup of coffee. Welcome to the club. Make sure to fill out your profile, add pics and start a garage. We did! Our sales associate was awesome to say the least. In fact, our two trade-ins are still on their used lot; a 2010 Corolla S 5-Speed (white) and our 2005 Honda Odyssey. We leased the Rolla because I was waiting on an X-Runner that I wanted s/c'd and it never came to fruition. We dumped the van because the trannies on Honda's (Pilots, Odysseys and v-6 Accords are notorious for dropping out around the 100k mark. We had 88k and no problems, just didn't want to keep it based on the rep). Thank you! I'm not new to forums, but the garage thing will take some time. I don't know if my trade in is still on the lot. It was a 2011 Sonata that I leased and chances are its gone. I had it close to 3 years and put on 33k miles on it. I went there on labor day to check out the GT since they were open until midnight and ended up buying it. My lease was expiring in March and I was actually in the money on it, and if I kept it, I would've went over the miles so I figured I'd trade it in a little early. The GT was built exactly how I wanted it. Titanium gray, black leather interior, 6 spd MT, style package, and technology package. The only thing I wasn't 100% sold on getting was the tech package, but I am very happy I went with it. I had a great experience with the sales guy there too and I ended up being there till close to 1 AM with him and the finance guy getting the paper work done. I need to get back up there for my free first oil change. An Entourage is Hyundai's van. They stopped making it in 2008 as it was basically the Kia Sedona (van) just a couple cosmetic differences. When we bought it, I did quite a bit of research on all available models and decided against the Honda because of the transmission issues. We got the fully loaded model (leather, power sliding doors, 6 cd player, DVD player, Infinity surround sound, etc) and we would have been looking at a 2-3 year old model of either the Odyssey or Sienna if we went with either of those. Needless to say, we went with the new van with a 100k powertrain warranty as we are planning on keeping it for quite a while. Heck, we're already at 54k miles and have only had it for a little over 3 years. Wow it sounds like we could have passed each other on the way home that day! Eric and I are both surprised at how the used cars aren't selling like we thought they would. I guess for us, being the first rear in the seat meant knowing how she is/was taken care of. These being our first Hyundai's we needed to know that it wasn't jeopardized in terms of care from the get-go. I know Oscar bought a Turboed Sonata trade in, white with 20's I think. That yours? I need to do more research on the "Tech Package and Style Package". My Elantra has everything I could have thought of and a few more things, though a built in Keurig couldn't have hurt anything. I'm still learning the features and how to work the Rosen. I can check Regional when I leave here, but do we have any 'garage days or get togethers'? I'd love to pick some EC Owners Brains in person. Jeff was our sales fellow. We bought our two from him and two nights later our daughter bought a Sonoma from him for a beater. My trade in was a Venetian Red, SE model. It was not the turbocharged engine. I had bought it a few months before the turbo models came out. As far as the "style and technology" packages, those are specific to the GT model which is based off the European i30 which is sold in other areas of the world. It is labeled as the Elantra GT for the North American markets. The style package includes features such as a sport tuned suspension, 17" wheels, leather interior, and a panaramic sunroof. The technology package adds on items such as push button start & proximity key, dual zone climate control, navigation unit & rear view camera. As far as local meets, none have been planned and to be honest I haven't seen very many folks on here from SC. I nearly fell off the couch when I saw Greer, SC! There are some meets that have occured in the past, but they seem to be more up north. I would be up for a get together myself. My sales guy was Steve Jenkins. If I read the board right, mine was the 3rd car he sold that day. If you have any questions on service and/or Hyundai's warranty just ask. I have owned several so I am quite familiar with those aspects. Where did you get your tints done and how much did it run you? That is something I plan to do in the spring. I got a stereo from Rogers Stereo and I know they do tints there. I think the guy said it normally runs around $200 for the full car. I haven't priced anywhere else yet though and I have only been down in SC for a little over a year so I'm still learning what places are around. Jeff Chastain was our fellow at HoG and he was great! I appreciate the offer for direction regarding the newest kids to our family. I negotiated 20% all the way around for both Hyundais as part of our 'we owe' deal closer. After they tinted our two, they stopped doing it because they discovered it's illlegal. There is a guy off Laurens/Stone Ave that does a remarkable job. He's $40 per window I think and might throw the little ones in for free. He did our Odyssey and it looked remarkable! Oh a Venetian Red one? Yummy, so why the trade? Talk about falling off the couch, I told Eric about you before I made my very first post. I was lurking and checking things out before they gave me the 'all clear' to be a member here. In fact, you're the reason I mentioned my city in my thread. I had hoped you lurked as well. I don't mind traveling for meets. I used to go to VA and NY for some of the former clubs I belonged to. I'll pm you my number so that you have it for the occassions you, the misses, me and my mister want to grab some grub in the Titanium Beauts! I also truly appreciate the warm welcome. I've owned several cars and stepped out of the car realm for a few years, you guys...er....uh....y'all make a new comer feel welcomed! There was a pretty nice sized meet up in Pittsburgh this year. I believe they are planning on doing it again next year and I am considering travelling up there if things fall into place. I have several friends in Pittsburgh, so it would give me a couple reasons to make the trip up there. Holler at me if you go, I'll run beside you! Maybe we could strum up some interest and pick up a few along the way. FYI, your leased baby is still there. She is sitting across the aisle from mine. I have the leased 2010 Rolla! I just got back from checking. Haha well looks like I should bring the extra key fob when I go in for an oil change. I told them I'd bring it in, but then couldn't find it. It was in a random box in the garage that I found the other week when looking for something else (the joys of moving twice in the past year)! I'm thinking of trying to get out there Saturday morning. Can't believe I've already put nearly 4k miles on my new baby. I rounded 1700 last night. Eric just did the first oil change on the Fe. He has about 3,700 on the odo. Can you guess which is the family vehicle? ;)Well in all fairness he travels further to work. He works at PET Dairy in Spartanburg. I work at the Patewood Campus of GHS with broken lil people. We have the free oil change for one car and he chose not to use it. Instead we got the ramps and oil/filters for the kids. If you want to have a garage day, scream at us. We will even play with the power tools!!! Suspension is my cup o'joe. I'm so ready to drop her like she's hot. Or as they say.....'dropped at birth'. When I went to HoG last night, I ran into Jeff. He said that he has a set of Veloster rims he'd sell me cheap. I may put those on. Somewhere here in this funny farm, I ran across a thread about it. We'll see. Well I work with broken baby specialists. Trololollolollolo isn't too far off. Aye, but what i was gearing for was BS, MS, or PhD? I have a BS Psych and work as a tech for at-risk kids in a residential facility. None of the above. I'm a physician's assistant for eight specialists. Not to be self-depricating but there really isn't anything super exciting here in terms of alphabet strings following my name. My primary floor really should be "Unit 5". Ah, ok. Almost like the nurses we have where i work. 2 Docs and a shrink, no assistants. The nurses carry out medical orders, while Behavior analysts enact programs.